Originally released in the early 1980's, the "Game & Watch" line marked Nintendo's entry into the portable video game market. Featuring liquid crystal displays and a handy size small enough to fit in a pocket, they quickly became a hit everywhere for gamers on the go. "Ball," released in 1980, was the first of many released by Nintendo. As the games evolved, so did the hardware. Later games made use of wide and multi-screen displays; they also pioneered the now familiar + Control Pad and button configuration. It's a desperate situation!! The paratroopers are dropping into an ocean filled with man-eating sharks. You must save them! Holy Henny-Penny, it's raining tools!! Move quickly and don't let any hit your head. Flip up a feast, but don't drop any food. That would be a waste! Move quickly and accurately to stop the moles as they tunnel your way! DK has kidnapped a girl and it's Mario to the rescue! --From the GBC Game and Watch Gallery 2 instruction manual. 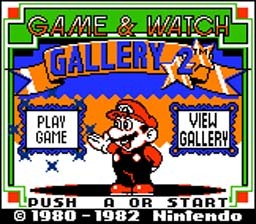 Play Game and Watch Gallery 2 Now! This is the second installment of the Game and Watch series for the Game Boy Color. This one includes five games, all different than the first. These are Parachute, Helmet, Chef, Vermin, and Donkey Kong. Visually, you got your 32-color scheme, and some big pixels to go along with it. Like the first, it's got the classic Game Boy MIDI-tones for the background music, and little beeps and chirps for character movement. The games are OK and good for passing time when you have nothing else to do. When the opening screen comes up, just hit A or Start to continue. Some instructions will come up, but those are only for Game Boy use. Hit A or Start again to skip it. You will then be sent to the list of games. The first one on the list is Parachute. In this game, little guys jump out of a plane, and you are in a boat on the water. You have to catch them without letting any of them hit the water. Drop three of them and it's Game Over. The next game on the list is called Helmet. There is a little bit of a difference between the Classic and Modern Version for this one. In the Classic version, you just have to avoid the falling tools. Occasionally the door on the right side will open and you can go through it and it will move you to the other side of the screen. In the Modern Version, a winged Koopa is throwing down hammers, trying to hit Mario. There is a "P" button on the ground that you have to step on to make the coins pop up out of the ground. You get to collect these while avoiding the hammers. If you get hit three times it's Game Over. The next on the list is Chef. This one has some slight variations also. In the Classic Version, you just move around and keep the food from hitting the floor. The modern Version is a little bit more complicated. Each time Princess Peach tosses the food up, it gets cooked a little bit more. Once it is cooked you want to feed it to Yoshi by letting it fall past you and to Yoshi, but you have to make sure Yoshi is under it, and you can make him switch sides by pressing the A button. If you accidentally feed Yoshi burnt food, then he gets small, and none of us want that. Once again, and you should have figured this out by now, if you let food hit the ground three times, it's Game Over. The fourth game is called Vermin. Once again, more variations. In Classic, you just move around with two hammers and hit the moles as the they come up. If you let three of them get past you, Game Over. The Modern version is a little bit more complicated. You are Yoshi and you have two hammers and you have to protect six Eggs. As the little flying trains and winged Koopas fly toward the eggs, you have to hit them before they reach the eggs and break one open. To everyone's surprise, it's Game Over when one of your eggs gets broken open. The last game is the All-Time Classic Donkey Kong. In the Classic Version you have to make it to the top level while avoiding the barrels by jumping over them. When you get to the top, you have to turn the crane on and jump on to it to break one of the hooks holding up the platform that Donkey Kong is on. Once you break all four hooks, Donkey Kong falls and you save Pauline. The modern Version is once again, a little bit different. You are Mario and you have to save Princess Peach. You avoid the barrels by jumping over them or jumping on the chains and tubes and holding on. Don't hold on to long though. They tend to break. After you turn on the switch, you go to the right and jump on the rotating platform and then jump to the red door above it. This takes away part of the platform that Donkey Kong is on. Once you take away all of his platform, then you save Peach. And you guessed it, if you get hit three times, GAME OVER!